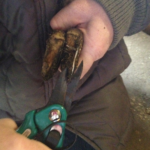 Goat hoof trimming is not as hard as it may sound and it necessary to learn how to do this if you are raising goats. This goat hoof trimming guide gives you all the information you need to get started trimming your goats hooves on your own. Train young goats to stand on the milk stand which doubles as a goat hoof trimming stand, get them lift their feet for you and handle their feet, just like you would if you were trimming them while they are on the milk stand so they get used to the routine. The first few times you do this to a young kid – or even an adult goat who is not used to having their hooves trimmed, they may kick and make a lot of noise, so be prepared to deal with that. Put some grain or a special goat treat such as sunflower seeds in a dish at the front of the milk stand to keep them occupied and soothe them with your voice. An occassional scratch on their side or their back often soothes a scared goat. 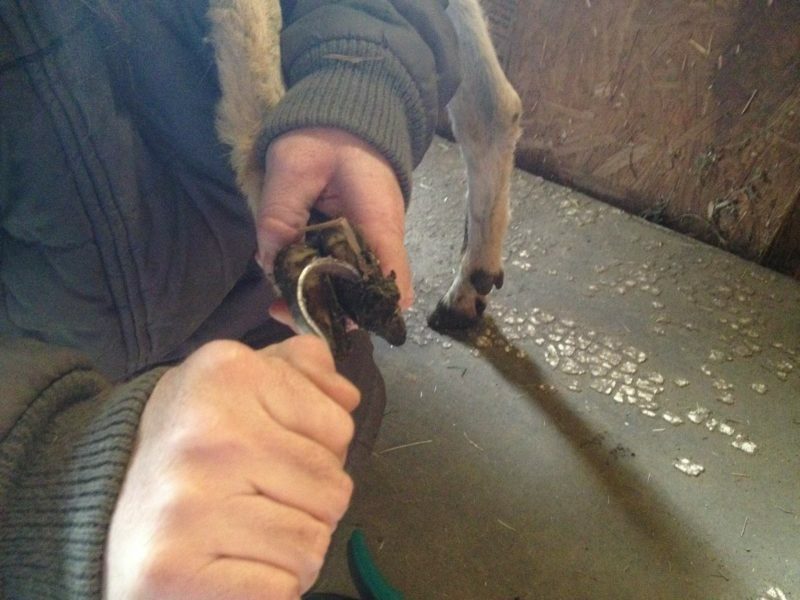 Sometimes it is helpful to have a second person with you to help keep the goat from stepping off the milk stand or pulling their leg out of your hand while you are trimming their hooves. Most goats require a hoof trimming every two to three months. Of course, if their pasture area is filled with rocks or if they have other rough surfaces to climb on, the amount of time between hoof trimmings might be longer. Each goat is an individual – just like us – and if you consider how much difference there is between the growth rate of one person’s fingernails and anothers, then you begin to understand why one goat may need a hoof trimming while the next one may not. Proper goat hoof trimming is important because a goat with overgrown hooves might become crippled or – worse yet – end up with rotted hooves, especially if the area they are living in is moist and soggy. In time your goats will learn what to expect during hoof trimming time. They will come to understand that the end result is that they feel and walk better afterwards. It is best not to offer grain to male goats, but during hoof trimming and shearing a handful of grain won’t hurt them. Before you get the goat on the goat hoof trimming stand, make sure the grain dish is filled with a regular serving of grain or sunflower seeds. A regular portion of sunflower seeds for most goats is one-half to one cup per day. Add some hay to the bottom of the grain dish before adding the grain or sunflower seeds if you wish. I also add Diatomaceous Earth (DE) and kelp to the grain dish – when I trim their hooves, shear them or milk them. Collect your goat hoof trimming kit – and make sure all the tools are clean. The tools should be cleaned both before they are put away and again before they are used. Clean them throughly with hot soapy water and rinse them with hydrogen peroxide. 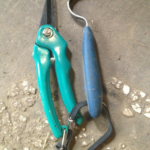 In my goat hoof trimming kit, I have a pair of goat hoof trimmers and a hoof pick – used for cleaning horse hooves – which helps me pick bits of rock and other debris out of the center of the goats hooves. Once my tools are assembled and the grain dish is hung on the end of the stand, I call one goat out of the goat pen. Expect all the goats to come because they know there is a treat on the goat hoof trimming stand they want it. It is up to you to make sure only one goat comes through the gate – and this can be tricky. Goats are a lot stronger than one might think. Ideally the goat will jump right onto the stand, stick their head through the head hole and start eating. Once the goats head it through the head hole, secure the goats head in the stanchion so he or she cannot get their head loose, then move to the rear of the goat. Turn your back to the goat, so your face is facing the back of the goat hoof trimming stand and pick up one leg by the ankle. A firm grip is a must. Some goats will try to pull their leg away or kick. Once you know you have a firm grip, use the hoof pick to remove all the dirt and debris that is embedded in the center of each hoof. This is a messy job and some people prefer to wear gloves when doing this. Once the dirt and debris is gone it makes it easier to see how much of the hoof needs trimmed. Start at the rear of the hoof and cut towards the toes. Look carefully at the hoof to see how long the toes are just in case you need to cut the front of the hoof area back to make the hoof shorter. This does not hurt the goat. It is simply part of an overgrown hoof that needs to be removed. Look at the heels as well. They are fleshy and seldom need trimmed, but every once in a while they seem to protrude. 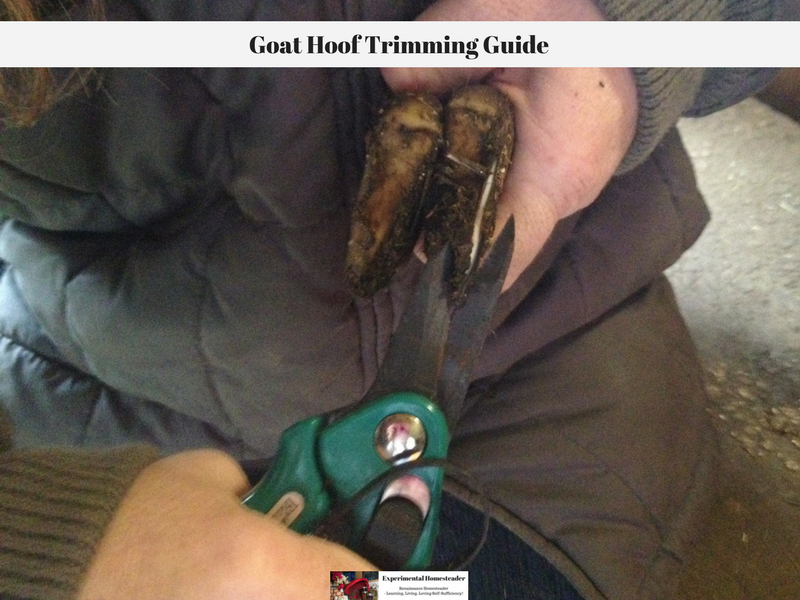 Your goal when you trim a goats hooves is to make sure the foot sits flat when you are done, so if you need to trim this area to make sure the hoof sits flat, then do so. At this point, some people like to use a woodworker’s Surform to sand the hoof. I do not do this. There are special hoof sanders you can buy if you prefer. I feel this step is not necessary as my goats have access to rough material that helps sand their hooves naturally. Once one hoof is done, move on to the next one. I prefer to do both rear hooves, then move to the two front hooves. 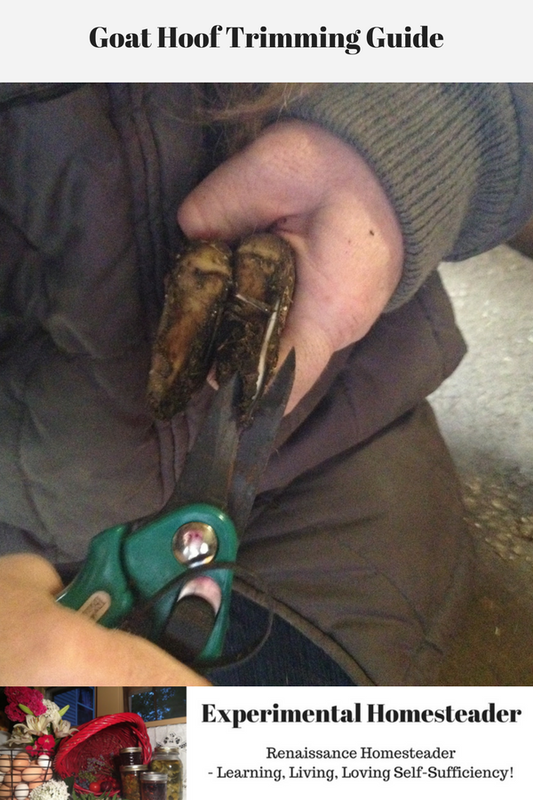 The first few times you trim your goats hooves, it is normal to feel unsure of yourself. It is also normal for your goat to give you a hard time and try to prevent you from getting the job done. As time goes on and both of you get used to the process it goes faster and smoother. Be sure to offer your goat a reward – such as a goat cookie or other type of special treat at the end of the goat hoof trimming process and spend some time just petting them. It is important to make this a special time for your goats that they look forward to, because let’s face it, goats can be stubborn and getting them to cooperate is not always an easy task!